Home April 1 2018 Vol. 38 No. 7 Feature Articles Supplement: Who Gets Immunotherapy for Cancer? Supplement: Who Gets Immunotherapy for Cancer? Single-agent or combination checkpoint inhibition (CPI) immunotherapy can have dramatic impacts for positive responders. But currently used nonspecific biomarkers are unable to definitively stratify and identify cohorts. This is a critical challenge; no one wants to deny care. Targeted biomarkers and companion diagnostics can greatly aid therapeutic decision making. Immunotherapy is an emerging field, and scientists are still learning how a patient’s immune repertoire and target profile translate to progression-free survival or disease remission. The immuno-oncology biomarkers, and companion diagnostics track at the 25th International Molecular Medicine Tri-Conference gathered experts to debate advances in predictive biomarkers for immunoprofiling for cancer immunotherapy. Even though thresholds are high for first-line CPI therapy, most patients do not respond. If non-small cell lung cancer (NSCLC) patients are to qualify for first-line pembrolizumab (Keytruda), they need to show a greater than 50% tumor proportion score (as measured by the FDA-approved PD-L1 IHC 22C3 pharmDx companion diagnostic from Dako) and be free of EGFR or ALK genomic tumor aberrations. Originally, for second-line Keytruda, the threshold was greater than 1% PD-L1 as determined by an FDA-approved test. Other second-line CPIs have been approved without a biomarker and companion diagnostic simply because they tend to work better than targeted therapy. Biomarkers such as PD-L1, mutational burden (microsatellite instability, MSI), or deficient mismatch repair (dMMR) face trade-offs between prevalence (percentage of positive patients) and predictive value (correlation to therapeutic response). 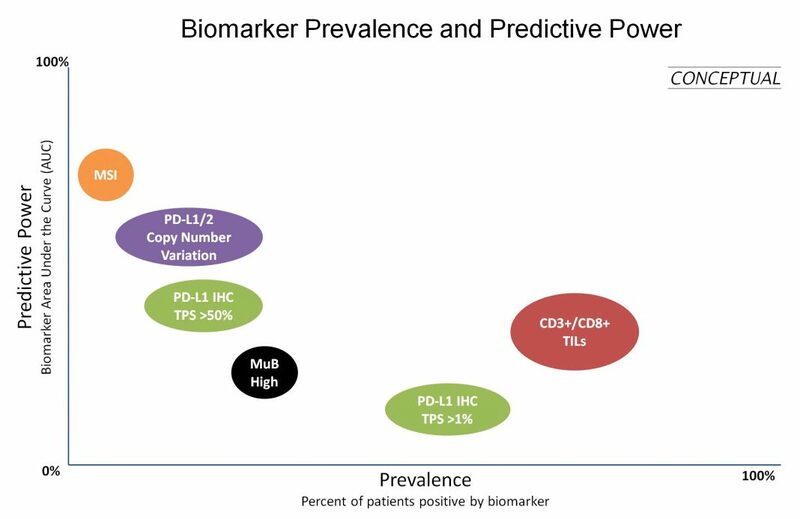 No single biomarker alone is both highly prevalent and highly predictive. Therefore, even with high current biomarker score requirements, response rates remain low. Factor in significant adverse side effects, and the dilemma becomes obvious. In immunotherapy, the host-driven immune system has to recognize the tumor as foreign and then send tumor-infiltrating T cells to the tumor microenvironment. Finally the T cells must prevail in “hand to hand” combat with tumor cells, including checkpoint blockade. If the entire process works, activated cytotoxic T lymphocytes will kill the tumor cells, and the patient is likely to respond. OmniSeq uses next-generation sequencing (NGS) and traditional imaging technologies for comprehensive immune profiling across the entire immune-response cycle. The Immune Report Card details the results from five different test modalities, including DNA-seq and RNA-seq by NGS, and includes a synthesized summary by an OmniSeq pathologist to assist in decision making. The company is working on a predictive algorithm that can consolidate results from retrospective studies and prospective trials to produce a single score that indicates the likelihood a patient will respond to single-agent immunotherapy. With this score, the physician can decide whether to prescribe combination therapy. 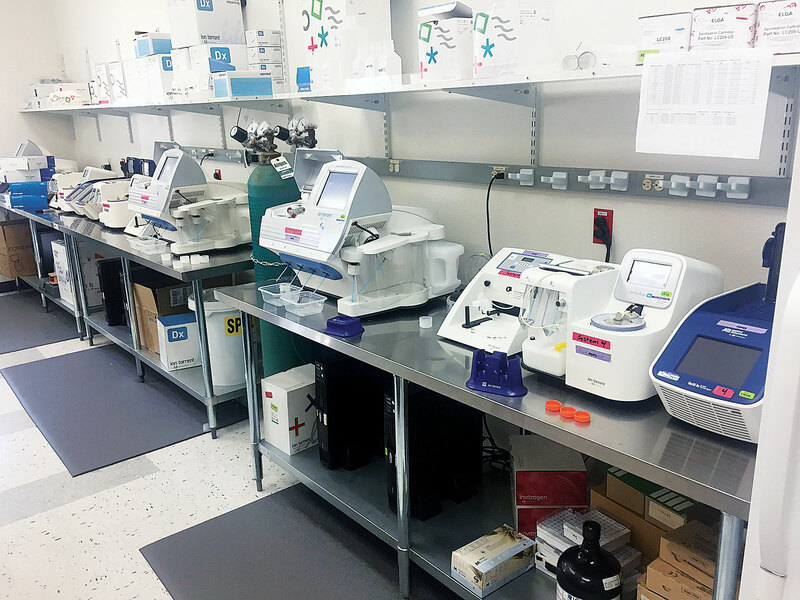 OmniSeq assays have been approved by organizations such as the College of American Pathologists and the New York State Department of Health, the latter of which maintains the Clinical Laboratory Evaluation Program (CLEP). One approved assay reports a percentile or rank of a patient relative to a reference population. Immunotherapy applications require more than just quantification of infiltrating immune cell subpopulations. Context is crucial, and concentrated efforts are underway to provide accurate information on the percentage and location of infiltrating immune cell subpopulations, both relative to each other and to tumor margins, as well as levels of expression of checkpoint and other immune markers. Most current clinical diagnostic tests on tissue use 3,3′-diaminobenzidine, the well-known brown stain. This technique functions well but does not allow for multiplexing. Multiplex tissue immunoassays are being used in translational studies to quantitatively and contextually profile immune infiltration in tumors both before and after therapy, but they have yet to be used clinically. The Cell IDx UltraPlex mxIF (multiplex immunofluorescence) technology, a simple two-hour staining procedure, can simultaneously detect multiple biomarkers in tissue using a standard two-step primary and secondary antibody protocol and existing autostainers, imaging scanners, and image-analysis software. The technology is modular (plug and play); approximately 30 primary antibodies have been qualified thus far. A unique epitope tag is conjugated to each primary antibody. A mixture of primary antibodies with different tags is applied to the tissue, and the antibodies are allowed to bind to their targets. Then a cocktail of fluorescently labeled high-affinity rabbit monoclonal anti-tag secondary antibodies is applied to detect and quantify each target. With fluorescence detection, four targets plus DAPI can be detected simultaneously. Six different tag/anti-tag antibody pairs are now available. Cell IDx offers a range of ready-made multiplex panels identifying immune subsets and checkpoint marker expression, custom panel development, and immunohistochemistry contract reseach organization services. The Ultivue InSituPlex multispectral technology also supports high-throughput multiplex tissue marker detection and analysis. InSituPlex integrates with commonly available autostainers, imaging scanners, and image-analysis software. InSituPlex solely relies on the use of primary antibodies. Complementary strands of DNA are associated with either a primary antibody (to bind to a target) or a fluorophore (to image). Multiple targets are stained simultaneously in a single staining step using antibody-DNA conjugates, where each conjugate contains a target-specific DNA strand serving as a barcode. By circumventing the need for secondary antibodies, InSituPlex simplifies the staining protocol, potentially reduces steric hindrance, and shortens validation cycles in regulated applications. Stephanie Walter, Ph.D., R&D team leader, Ultivue, indicated that her company is pleased with the level of marker multiplexing and sensitivity achieved through its assays. For each multiplex panel assay, robust analytical validation and reproducibility has been demonstrated using formalin-fixed paraffin-embedded sections and whole-slide imaging. In preparation for the launch of its first InSituPlex products later this year, Ultivue has expanded its portfolio of validated immuno-oncology antibodies to include the most relevant markers for tumor immuno-profiling. 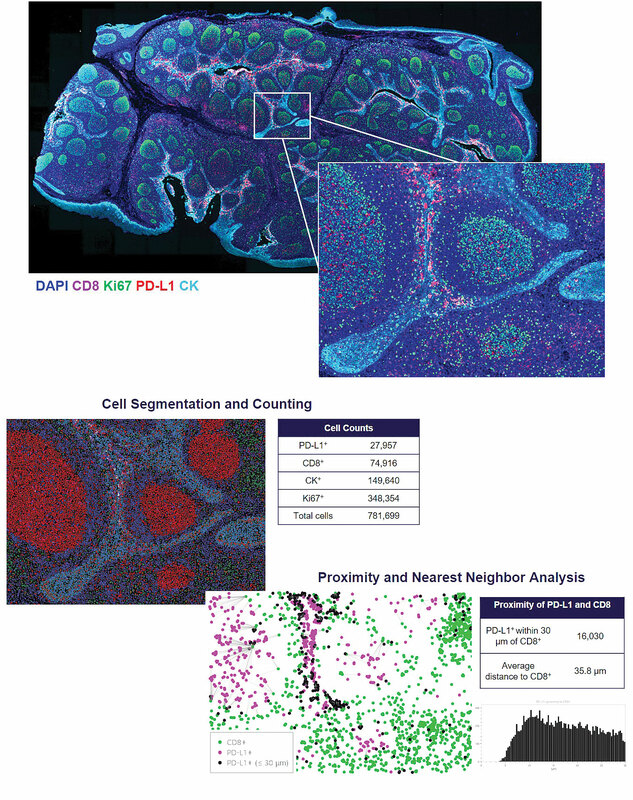 Fully optimized 5-plex kits including a DAPI counterstain will be offered with a protocol requiring only a single antigen retrieval step, a single staining step, a single amplification step, and a single whole-slide image acquisition step. Image acquisition will require the use of imaging scanners with four distinct filter sets to avoid any linear unmixing. End users will be able to perform 5-plex whole-slide imaging of over 10 slides in six to seven hours. Services provide outsourced access to optimized assay panels with imaging analysis for evaluation using customer-provided samples. Strategic partnerships for companion diagnostic test development will focus on co-developing clinically relevant marker signatures associated with ongoing or future therapeutic programs. 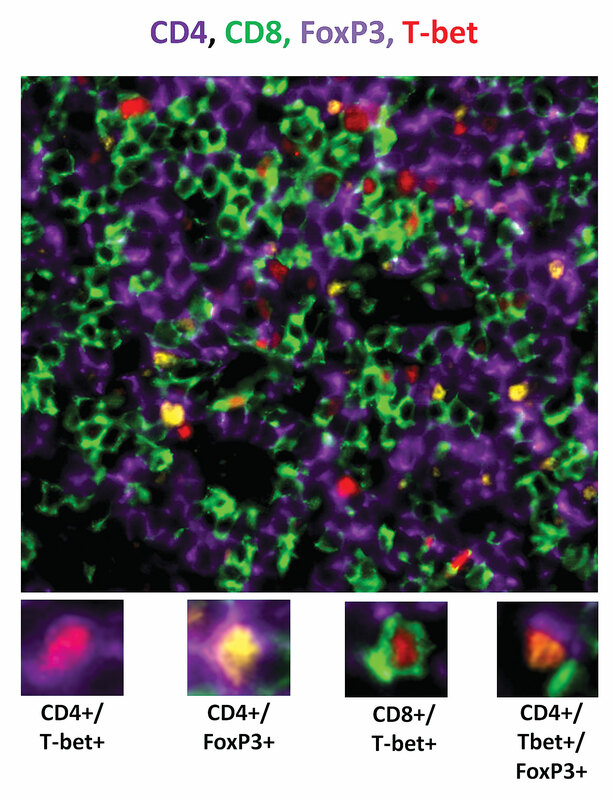 Simultaneous detection of CD4 (purple), CD8 (green), FoxP3 (yellow), and T-bet (red) on tonsil tissue using Cell IDx’s UltraPlex mxIF technology. Also shown are cells that co-express multiple markers. Immuno-oncology therapeutics are designed to activate exhausted T cells. While compounds have demonstrated substantial efficacy, most treated patients fail to respond. As such, combination trials of immuno-oncology therapeutics combined with small-molecule inhibitors have been undertaken. Leukocyte populations can be monitored using a combination of flow cytometry for cell counts and ELISA-based approaches to assess functional activities. Changes detected in patients’ circulating leukocyte or lymphocyte populations can be used as pharmacodynamic biomarkers to help characterize mechanism of action and complement safety and efficacy assessments for dose selection. Cytometry-based assays provide the ability to monitor pharmacodynamic effects in real time. Cells in the patient’s circulation can be counted immediately preceding or following administration of a therapy. Flow cytometry has been used for decades and is well characterized, and the reagents are readily available. In addition, the single-cell technology is multiparametric and semiquantitative, and it has a broad and dynamic range. Flow cytometry can be an important part of the immuno-oncology workflow to quantify immune cells. Unique flow cytometric panel designs and specific mixes of antibodies for immuno-oncology applications are available through MedImmune, noted Nathan Standifer, Ph.D., a senior scientist at the company. When MedImmune began using this method, 8 cellular surface markers could be evaluated; new systems can examine greater than 20. While flow cytometry has been used as a standard technology in research laboratories, its use in clinical trials is more recent, and tremendous opportunity exists to improve analysis of the clinical data generated by better defining the parameters for integration of clinical and flow results, detecting differences above the baseline and separating signal from noise. Development of globally accepted ways to analyze data will increase its usage. Ultivue’s InSituPlex technology detects and analyzes tissue markers. Upper image (and inset): staining shows CK, CD8, PD-L1, and Ki-67 in a whole-slide tonsil section. Middle and lower images: The same section after image analysis algorithms have been applied. MolecularMD helps biopharma clients mitigate the risks associated with drug-diagnostic co-development by providing a versatile approach to addressing clinical, technical, regulatory, and commercial requirements. The company has experience in building biomarker assays, performing global clinical trial testing, developing in vitro diagnostics (IVDs) from prototype assays. It complies with Current Good Manufacturing Practice (cGMP) regulations. and maintains strategic partnerships with IVD platform providers. According to Dan Snyder, the company’s president and CEO, over 75% of targeted and immuno-oncology investigational therapies in development depend upon diagnostics to support their clinical end points and demonstrate response. While the intent of diagnostics is to reduce the risk of therapy development and subsequent approval, if not planned and implemented properly, a companion diagnostic can add significant risk to regulatory approval of novel oncology agents. A well thought-out plan to access clinically representative samples and a proper sample management protocol are critical components to risk management. With a recent guidance entitled, “Developing Targeted Therapies in Low-Frequency Molecular Subsets of a Disease—Guidance for Industry,” the FDA has allowed clinical-trial therapies and associated diagnostics to be validated based on the target across a broad range of tumor types, helping to address the challenges of having to source positive specimens from only one tissue type. In co-development projects, clinical trial assays are often designed and validated under tight timelines to be ready for “first patient, first visit” deadlines. Without the proper implementation of design controls, critical clinical and analytical design components can be overlooked until later in the study. Design changes must then be incorporated, putting both the diagnostic and the associated drug program at risk. Plans for a bridging study should always be in place. Also, it should be assumed that assumptions will have to be changed, and that all clinical samples will need to be retested to demonstrate equivalency. In immuno-oncology, more variables exist due to the challenges in demonstrating the clinical utility of the biomarker assay, establishing clinical cutoffs, and defining analytic performance requirements. Another level of complexity is encountered during the broad investigations that accompany drug combination trials. A single test is insufficient to properly select patients; multimodal testing is required. MolecularMD helps biopharma clients mitigate the risks associated with drug-diagnostic co-development. The company has experience in building biomarker assays, performing global clinical trial testing, and developing IVDs from prototype assays. The company operates as a cGMP medical device manufacturer. A successful response to cancer immunotherapy is only partly a matter of immune cell dynamics within a tumor. If a tumor is to be reduced and cleared, cancer immunotherapy must also engage systemic immunity. For example, successful cancer immunotherapy can activate a population of peripheral memory immune cells. Cancer immunotherapy can also incorporate responses at the tumor site influenced by interactions between the gut microbiome and the immune system. Cancer immunotherapy can be monitored through assays of protein biomarkers such as cytokines, chemokines, and growth factors. These biomarkers occur in blood samples, which may be obtained more easily and frequently than biopsy material. Biomarker signatures from the circulation may correlate with those from the tumor microenvironment. Also, blood-derived signatures may provide unique insights to overall response and efficacy. Myriad RBM’s multiplex immunoassay testing service has been used for numerous checkpoint inhibitor studies in multiple cancer types to quantify T-cell activation, interferon-gamma signaling, inflammation status, immune suppressive phenotype of myeloid-cell-associated proteins, tumor burden, and angiogenesis, says Dominic Eisinger, Ph.D., vice president, strategic development, Myriad RBM.